I made a new skirt over the weekend, surprisingly. There were about fifty gazillion other things I should have been doing (and I came down to the office this morning to find that a deadline which I thought was next Tuesday, was, in fact, this PAST SATURDAY, oops), but when the sewing machine calls, one must listen. And yes, it has all my favorite (bright, cheerful) colors. 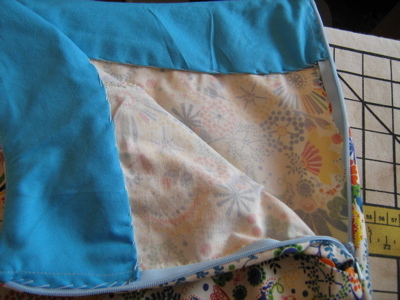 I used New Look 6410, which I modified to add front scoop pockets. Doing that wasn't hard — I think it worked on the first try, which was nice. 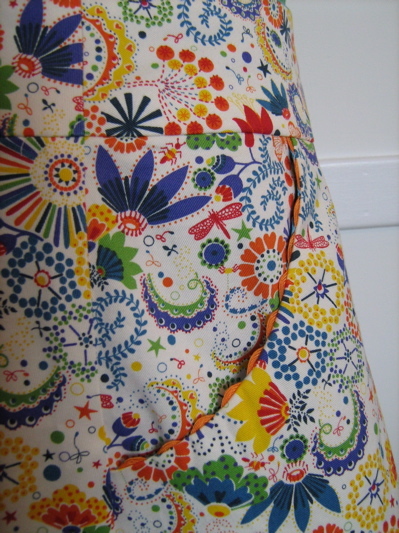 I've probably made this skirt two or three times, although never with fabric that I love as much as I love this fabric. The whole skirt probably took about two and a half hours to make, with about twenty minutes of that time spent looking for a pattern piece that had fallen behind a piece of furniture. (I had the pattern pinned to a corkboard instead of put neatly away, for some reason — probably laziness.) The invisible zipper went in very cooperatively. Once you resign yourself to the necessity of basting (and, in my case, of digging out the screwdriver to change the presser foot shank), invisible zippers aren't really any more trouble than visible ones, and they look so much nicer! 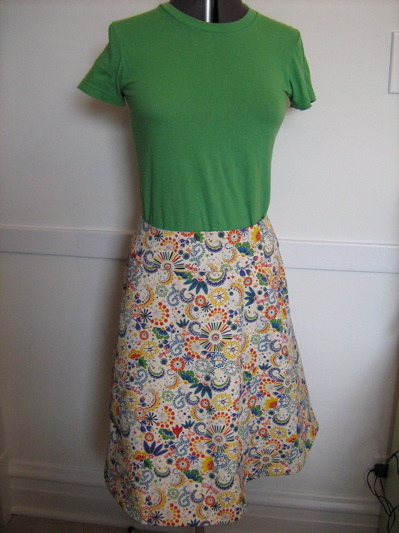 I plan on wearing this skirt with brightly-colored polo shirts with differently-brightly-colored tees under them, and my orange Jack Purcells. At which time it will be really, truly summer. No, not really — this is NOT the last Linktastic Friday. But I haven't done one in so long, that I thought ridiculous hyperbole would be justified. Oh, and Jen at MOMSpatterns has offered us another coupon code, so that we can all take advantage of being members of the sewing blog cabal. 20% off from now until May 23, by using the code 'iheartsewing'. In other cabal news, Cherie at Shrimpton Couture is having a 15% off sale through the end of May. You HAVE to check out this bathing suit up right now at Dorothea's Closet. I mean, REALLY. GO THERE NOW. Look at what the pigeons are doing! And then marvel that somebody's three-martini lunch actually made it into production. Barb has a new blog about sewing with neckties. 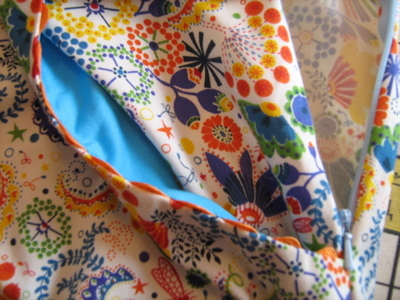 And Libby has put her *stunning* necktie dress up at BurdaStyle. It was for her 50th birthday, and she looks magnificent. Happy birthday Libby, and thanks for being an inspiration — I have now penciled in "make necktie dress" for August of 2021! Cat sent me a bunch of links to Sartorialist-style street fashion photos from around the world. I really liked the Japan one. Sure everyone is young, and cute, and has an asymmetrical haircut and interesting socks, but that's not a BAD thing. Did you know some site called Kaboodle (which I never heard of before, and have no idea what they do) is having a contest with Marie Claire magazine, in which they ask you to take a picture of yourself in your favorite spring dress? The winner gets $1000 and a trip to NYC. I've only seen one vintage entry so far, and I haven't really seen much handmade stuff. Mostly sundresses. I think maybe we should all enter. 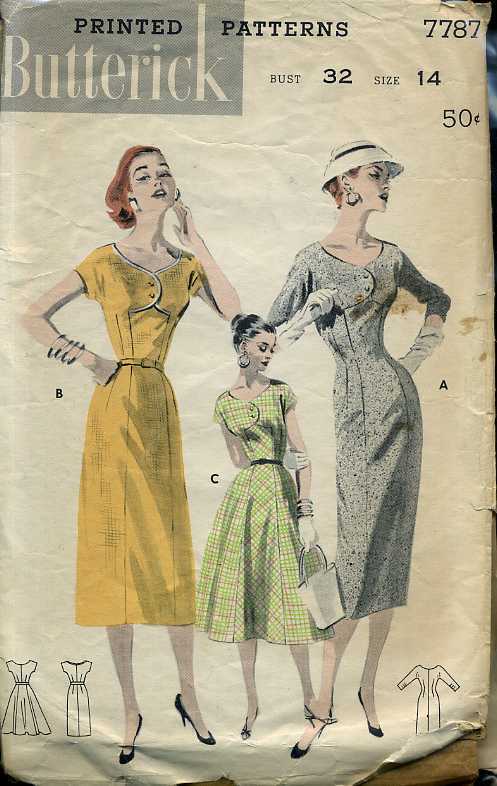 Especially those of us who like to wear vintage, or who are not model-sized … first round of the contest ends June 12. If you enter, let me know and I'll go vote for you! 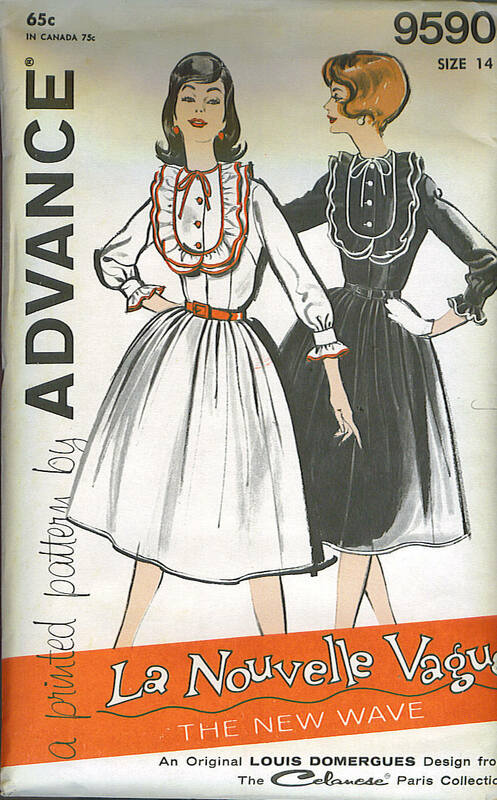 Or, you know, you could just enter the Pattern Review vintage sewing contest. To counteract the recent NYT story on the demise of the dress, is a story from the Guardian on how dresses are being reinvented. Thanks to Susan for the link! 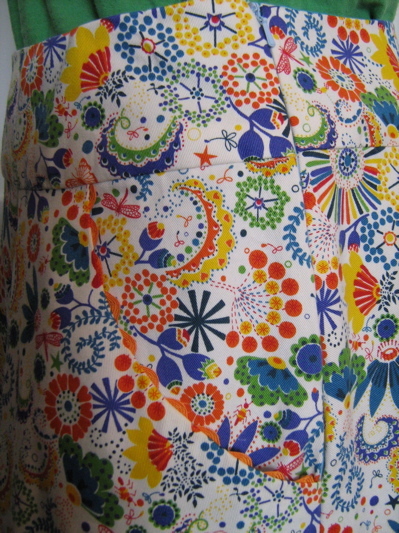 In case you were worried I had found a new obsession and not told anyone, here's a shirtdress, sent in by Deb. Check out the collar, it's yummy. And this one, which has CHEVRON POCKETS. Or this one, which has four pockets AND a cute collar. Mary Beth sent a link to Shay's blog, where SHE links to a great set of scans of a 1920s comic, Ella Cinders. Eirlys sent a link to a thesaurus bracelet that she found on Etsy. Ooh, pretty! Laurie sent this robot clutch purse, which is cute but obviously made for humans. Robot pincers don't clutch, they DESTROY. Plus you keep your robot lipstick and robot keys in your chest plate — everyone knows that. Mindi put her favorite pattern, ever, up on the wiki. Go and marvel. And Lorraine sent a link to a dress that looks like the walkaway dress as reimagined by Loretta Lynn. All right — linktime's over — I should really go and get some Actual Work done now, but many, many thanks to all of you who commented on yesterday's post — I was overwhelmed by your kindness and generosity. Thank you! I don't usually take the time to reply to negative comments that are left on this blog — why encourage people who are spoiling for a fight? I'm not bothered by their criticism, for the most part (and if it's justified I do try to take it to heart, however unpleasant it may be to do so!). But most of the time replying to negative comments falls under the heading "Never wrestle with a pig. You get dirty and only the pig enjoys it." However, there have been a few comments on a recent post which I feel I need to respond to, if only for clarification. A commenter, mainly anonymous, but also signing one comment "7/10 split", suggested that I am a "professional what? writer/ advertisers? whose goal is to sell things", and also a "shill." For the record: I am not a "professional advertiser". I am a writer, but of a very particular kind. 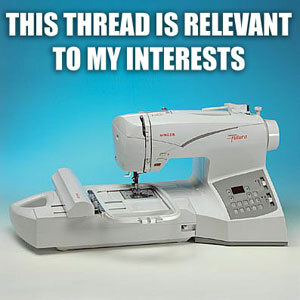 The same commenter (who may be this blogger) also suggested that I don't sew the dresses that I post here. If you would like to see pictures of ME in the dresses I have sewn (and I admit, I don't often post pictures of myself here because, all things considered, I had a better time in labor — and I didn't have an epidural! — than I do having my picture taken) you can see them in five out of the first six pictures here. Whether you enjoy my posts or not, I would like to state unequivocally that I do NOT accept money to post about any particular dress, fabric, pattern, pair of shoes, etc. There is NO payola or kickback scheme in effect on this blog. For book reviews, I am, as is common practice in publishing, often provided with free copies of the book in question, to review or to give away. The advertisers on the right-hand side are just that: advertisers. They have no influence on content, and I do *not* ask them for free stuff. I have set up "Dress a Day Inc" as a LLC company, so that, if I say something libelous and am sued, the company will be the target of any lawsuit (and not my family). This means I file taxes on all the income from this blog — if there is any, after paying hosting fees to my internet service provider. As for the comments about the sweater in question, I am doing a little research on the subject; the commenter suggested that the sweater probably cost less than $1 to make, and that all the labor involved was sweatshop labor in Asia. I don't think that's right, given that the cost of a pound of even low-grade cotton is about .71 — that's a pound of unspun cotton. From what I can tell, the spinning of one pound of raw cotton fiber produces 840 yards of yarn. That seems to be on the low end of the number of yards you'd need for a sweater — any knitters want to jump in here? — and the sweater I posted about was 14 gauge, which is a fairly fine knit). So, at least .71 in raw materials, plus the spinning cost, plus the fashioning cost, plus the cost of the buttons — I think it would be hard to get the raw goods cost of this garment under $1. 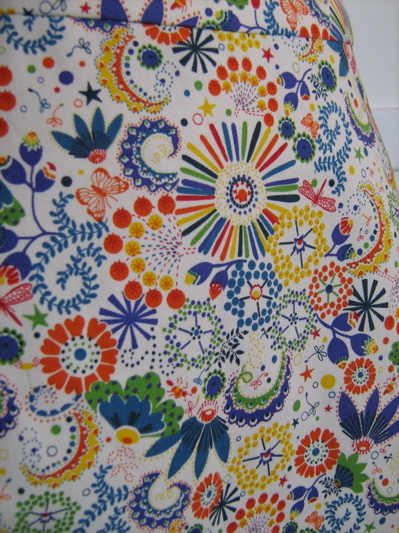 Even leaving aside that the garment is made in China (I called and asked) — there's the cost of the coming up with the design, a job almost certainly done by an American at American wages. (J.Crew employs about 7600 people.) The same commenter said that the sweater I linked to could be found in discount stores for under $20; if, in fact, that is the case — why haven't I found it there? It's not like I haven't been looking! 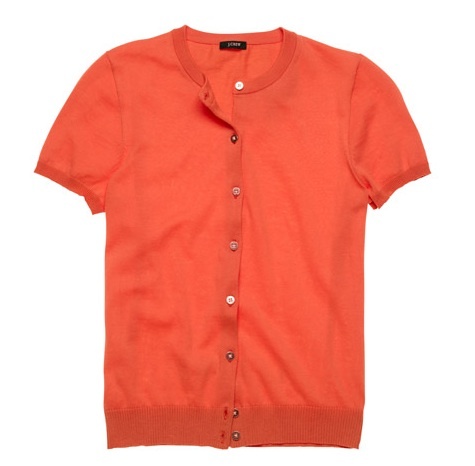 Do you factor the salary of the designer into the cost of the sweater? If not, why not? Do you factor in the jobs of the catalog writers (Americans), shop employees (American and for the stores in Japan, Japanese)? The distribution center employees (in Virginia and North Carolina)? The UPS guy who will bring it to me? (Hi Luis!) The short answer, it seems to me, is that a narrow focus on manufacturing jobs is not helpful; if the company can't manufacture goods at a reasonable price, then all those other jobs I mentioned above — they go away, too. Despite conjecture about how much of the price of the sweater is pure profit, large retail chains have VERY small profit margins — one source puts it at 2%. Another source (from 1998!) puts the apparel profit margin at 5.4% … and given the rising costs of commodities since 1998, I can't imagine that margin has gone up. I apologize for such a long and tedious post, without even any pretty pictures to enliven it; I promise not to make a habit of this kind of thing. However, I do treasure the trust you place in me by visiting this blog, leaving comments, and contributing to a little oasis of dress-loving camaraderie online, and I didn't want to give credence to accusations of shilling, payola, and "blogging under false pretenses" by letting them go by in silence. If you ever have any questions about me or this blog, well, my email address is on the right-hand side, towards the bottom. I do try to answer all the email I receive. Every time I worry that we are, in fact, in the end times (trying to remember if those wackaloons have bred their red heifer yet, and then beginning, ridiculously, to wonder what exactly would be the best thing to wear to the Apocalypse — certainly it would need a lot of pockets, and of course if you are facing the Apocalypse surely you wouldn't care about eventual lung cancer, but could use asbestos cloth … and would red be too matchy-matchy?) I remember that, even if we are rapidly approaching the time of Peak Everything; there are consolations; even if the world is running down, we can make the best of what's still around. Like, for instance, the Internets. Which lets me, with the click of several buttons, browse through an exhibit from the Met back in 2002 — Blithe Spirit: The Windsor Set, and see the dresses of another time when some had it that there was no use planning for the next year, much less the next decade; a time when they were going to party like it's 1939. It always surprises me that mere electrons can manage to carry such treasures to me through wires and waves; treasures nearly as ephemeral as those electrons. How improbable, how ridiculous! What petite main in Vionnet's studio would believe it, if she were told that some American woman would, seventy years in the future, look at this dress–basically over the telephone? She'd stick you with a pin, and tell you to stop wasting her time. The woman for whom this dress was made would snort — she'd believe that in a year, maybe two, her dress would be hopelessly out of style, and not worth anyone's attention. 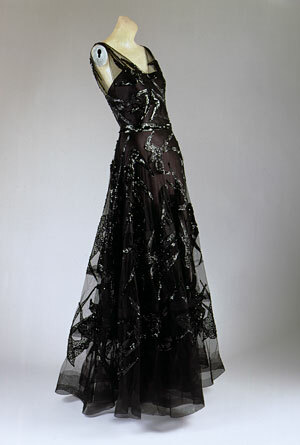 This dress is black silk satin and black silk net, with sequins. (A dress made of wet toilet paper would probably be less fragile.) And yet — it's still here. Its maker is gone; its wearer is gone; every man who guided it through a foxtrot, long gone: but it's still here. Still here, and since it's in a museum, safe and protected from everything from excess humidity to violent video games, likely to continue to be here, and through various generosities and some very clever engineering, we can up our brass periscopes outside our daily concerns and just, for a moment, look at it. It might be taken (black birds, so ill-omened!) as a memento mori, but it might also be taken as kind of defiant monument: if something so delicate could abide through such terrible history, why shouldn't we? I'd like to call this a reverse Ozymandias; no "look on my works, ye mighty, and despair!" but instead, a quiet invitation to rejoice. And now, in answer to unarticulated prayers, it seems that J. Crew — yes, that J. Crew — has them. In TWELVE colors, including orange, kelly green, and TWO different yellows. Now if I could only find mesh polo shirts that measured 21 inches or less, shoulder to hem, in nice colors, WITHOUT some big honking logo, my (sartorial) life would be nearly perfect. Are these, or are they not, insufferably adorable? Seriously, these are the cutest things I've seen since my son was two. 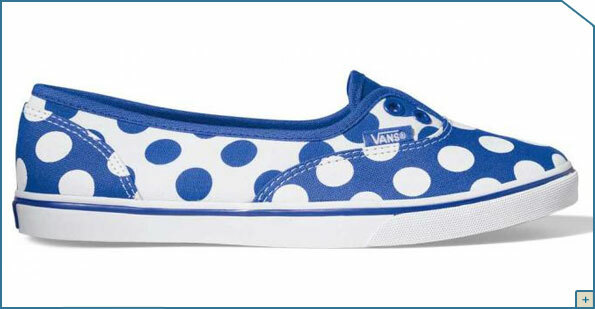 And I know, I know, I've sworn undying devotion to the shoes of Jack Purcell, but a girl can LOOK, can't she? I think it's the extremely low vamp, which I think always looks feminine and dainty. (YES, no matter HOW big your feet are. Seriously.) In fact, this reminds me of a holy-grail pair of shoes: the very-low-vamp saddle shoe. There was a girl in my junior high who had a pair, and damned if I can remember her name, what she looked like, whether she was even in any of my classes … but I remember the low-cut two-tone saddle shoes she had. In detail. It was a sad, sad day when I finally figured out where she got them (Thom McAn! Back when they had standalone stores!) and got my folks to take me to the mall … only to find they were sold out of my size.